The name stands for Graphics Interchange Format and means a bitmap image format. It is often pronounced with an affricate as in "giraffe". Gif format was developed in 1987 (CompuServe) to replace the earlier RLE format which was black and white only. Nowadays Gif is widely used on the World Wide Web, both for still images and for animations. Gif uses LZW data compression which is much more efficient than the run-length encoding. Due to it you can download large images even with a slow modem for quite a reasonable time. The optional interlacing feature made it possible to recognize even a partially downloaded image as a user can abort the download if it is not what was required. GIF images are limited to 256 colours, though it is possible to hack around this limitation, under certain circumstances, using the animation feature. You can open and view GIF images with a free image viewer from Coolutils. It can show the thumbnails or full-sized images. 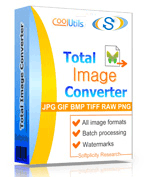 Once you want to convert GIF to JPE, TIFF, PNG or other formats, try Total Image Converter.